These Dynacast pieces caused some confusion when they first turned up. They did not come from the vendor who prototyped Kenner\'s POTF coins, and, as a read through our Special Feature entitled \"A Coin is Born\" will prove, they don\'t fit into the production process we know to have been used to in their development. Moreover, they turned up with their edges reduced (where a standard coin hardcopy has a considerable amount of edge area around its central image, these don\'t) and, in all but one case, painted silver. At this point, the best theory is that they served more as presentation pieces than as actual steps in the production process. The paint and smaller circumference seem to suggest that Kenner made them (probably internally) in order to visually represent what the POTF coins would eventually look like. After all, if they were photographed in the right way, without any reference marks for scale, one could easily interpret them as being 1.5\" in diameter. 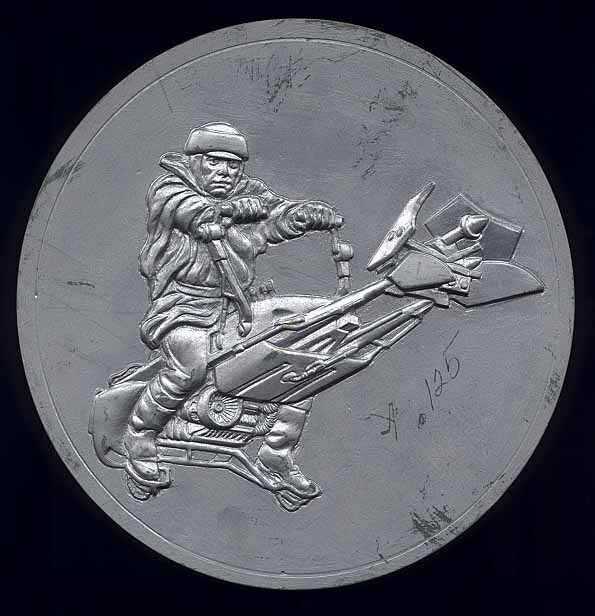 We know that most original coin sculpts were returned to Kenner once their vendor had finished with them. It\'s possible that Kenner\'s model shop made silicone molds of some of these sculpts, from which they cast these Dynacast pieces. Only 5 are known to exist.